Following the same basic exercises over and over again, is not only boring, but it will eventually lead to a plateau. That’s why I’m excited to share with you part 1 of the interview I did with the Mad Scientist, Nick Nilsson. Craig Ballantyne: Why don’t you tell us a little about your training background and how you got into doing the exercises that are so unique? Nick Nilsson: Sure. I’ve been training about 18 years now, so probably about half my life, I’ve been at it. I have a degree in Exercise Physiology and degree also in Psychology, which doesn’t really match at all. I’ve been a personal trainer for the last 10 years, and I’ve been doing a lot of online stuff. What really got me into inventing these screwball exercises is my dad…. When I was a kid growing up, I thought it was perfectly normal to have a basement gym made entirely out of plumbing pipe. That’s what kind of liberated me from feeling that I had to follow the straight up exercises as it was laid out before. So, as I got into training more and more I started coming up with some twists on exercises, and I went with that. I found the more I tried to adjust things the better results I got. A lot of exercises that I come up with target the muscles much better than the standard kind of exercises. Not to say that the basic stuff doesn’t work, but sometimes a little twist can make them work a whole lot better. Craig Ballantyne: When did you first start changing your exercises? Were you doing that right off the start or did you get into that a little later after you got bored with traditional exercises? Nick Nilsson: It was probably within the first year of my training. When I first started into it I had basically followed just the normal exercises. Those were great and they got me results, so I didn’t feel any real need to change things up. But, as I was reading more and more and seeing how other people were changing things up, I thought, “I can do that too.” With the background I had in training and my dad’s basement gym to muck around, I just started messing around with things and adjusting them. As I learned more Kinesiology and Biomechanics, I started developing a better grasp of how to change things to be more effective. So, as I was adjusting things on the fly sometimes I’d just come up with things as I’m doing the exercise. Just making these little adjustments on the fly and twisting things around I was thinking OUTSIDE the box. I really realized that there’s something to this. This isn’t just all about making new exercises for the sake of not being bored; this is new stuff for the sake of better results. That’s kind of the key that I was going after. Craig Ballantyne: All right. Can you give us a couple of your first classic ones that you came up with that are really good just to give them a taste of what you’re doing different? Then we’ll go through how you actually come up with this. Nick Nilsson: Absolutely. One of the very first ones I did, I named it after myself. I call it a Nilsson Curler. Basically, it’s a bicep exercise, but it looks almost exactly like a chin up. The difference with this one is you’re actually bracing your forearms against something so that your forearms can’t move as you’re doing a chin up. You can picture this one, let’s say you’re on a playground, and you grab a straight up and down ladder. Grab the top rung and the next rung down you’ll brace your forearms against. Now, in that position you do a chin up. Because your forearms are braced, they can’t move forward. This basically throws all the tension onto your biceps while you’re doing the chin up. So, you can imagine putting 90 percent of your bodyweight onto your biceps. You’re going to get some pretty SERIOUS RESULTS from that. Craig Ballantyne: Can you do that with dumbbells? Nick Nilsson: No, not that particular exercise. You really need a rack or I’ve seen people do it with the side of the rack. You take the two rails , the rack and put them just like ladder rungs, or take a bar and put another bar on the safety rails and brace your arms that way. If you want to add weight you can put a dumbbell between your feet. But, as far as bracing your forearms and doing a dumbbell curl like that, I haven’t really thought of a way to do that. Craig Ballantyne: What are some of your favorite dumbbell exercises? I know we have members who are working out at home just with a very small amount of equipment. So, what are some of the coolest dumbbell exercises you have for upper body that you’ve tooled around with? 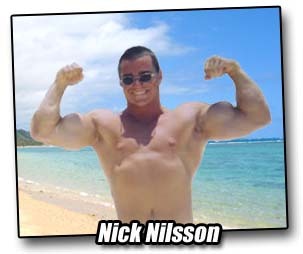 Nick Nilsson: One of my favorite ab exercises actually is one that if you do it in a gym it’s going to make people think that you’re absolutely insane. Basically, you’re on your hands and knees, but in your hands you have a couple of dumbbells. So, you crawl forward, not on your knees but on your feet kind of like a Spiderman movement, except you’re holding dumbbells in your hand. So, you’re walking forward on these dumbbells. Let me tell you. If you’ve never done any kind of movements that put torque on your abs this one is just going to open your eyes up, because you basically take crawling forward and then crawling backwards, and each time you step you’re moving those dumbbells forward. It puts a lot of cross tension on your abs. Craig Ballantyne: How much weight are you using in that? Nick Nilsson: I’d say start light. I’ve worked my way up to 100 pound dumbbells. Nick Nilsson: That one is a killer, and it’s one of my favorites. As far as a good chest one, let me see, I’ll think of a really good one here. Not that they’re all bad, but some are just better than others. A trick that I like to use when I’m doing dumbbell bench press, for instance, is when I’m coming to the end of a set and this is done while you’re doing dumbbell bench press on the Swiss Ball and you’re starting to get to that last rep where you’re kind of fighting for it…. You basically focus on moving one dumbbell, and then you focus on moving the other dumbbell and you kind of ratchet your way up until you’re right at the top. You can actually squeeze out one or two more reps off of that even at the end of a really hard set. With the chest one, I guess you’re doing dumbbell presses quite a lot, so you can always think about ways of doing that. But, for some of the more advanced ones or unique ones, what’s the impetus to get you started on that? Nick Nilsson: A lot of the times it’s really something completely unrelated. Like for that ab exercise, I can tell you exactly where I came up with it. I was getting ready to put weights back onto the dumbbell rack and I was kind of leaning over. I moved one forward and I was kind of in that crawl position and I just felt it immediately in my abs. I thought, “If this happens just when I’m moving the weights, I wonder what if I turned this into an actual exercise and focused on that.” So, immediately turned around and started crawling forward with these dumbbells and I just about lost my lunch. Sometimes you come up with some pretty amazing stuff. Next up in part 2, learn what makes your workout effective for muscle building.